Former NFL coach and ESPN commentator, Mike Ditka, got caught dozing off on December 29th’s live broadcast on ESPN’s Sunday NLF Countdown. When the show cut back to the studio, Keyshawn Johnson gradually realized Ditka was asleep, and nudged Ditka awake about as inconspicuously as possible while on live television. 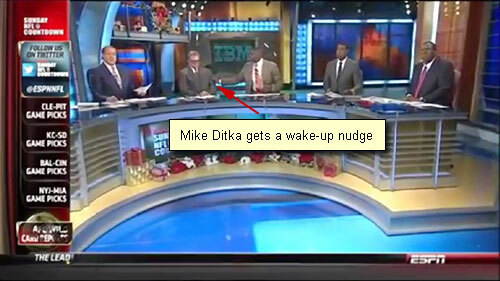 Photo shows Mike Ditka being nudged by Keyshawn Johnson after Ditka fell asleep on December 29th’s ESPN’s Sunday NFL Countdown. Ditka coached the Chicago Bears for 11 years and New Orleans Saints for three years. Ditka and Tom Flores are the only two people to win an NFL title as a player, an assistant coach, and a head coach. Ditka was the only individual to participate in both of the last two Chicago Bears’ championships, as a player in 1963 and as head coach in 1985. The Chicago Bears announced in May 2013 that they plan to retire the former head coach’s No. 89 jersey on Monday Night Football, December 9, 2013 during halftime when the Chicago Bears meet the Dallas Cowboys. The Bears franchise said that Ditka’s No. 89 Jersey will be the last number they plan to retire. Sports Speakers 360 is a booking agent for motivational sports speakers. If you would like to book athletes like Mike Ditka for a speaking engagement, autograph signing, guest appearance, product endorsement, charity fundraiser or corporate event, contact our booking agent for appearance and speaker fees or call 1.855.303.5450.